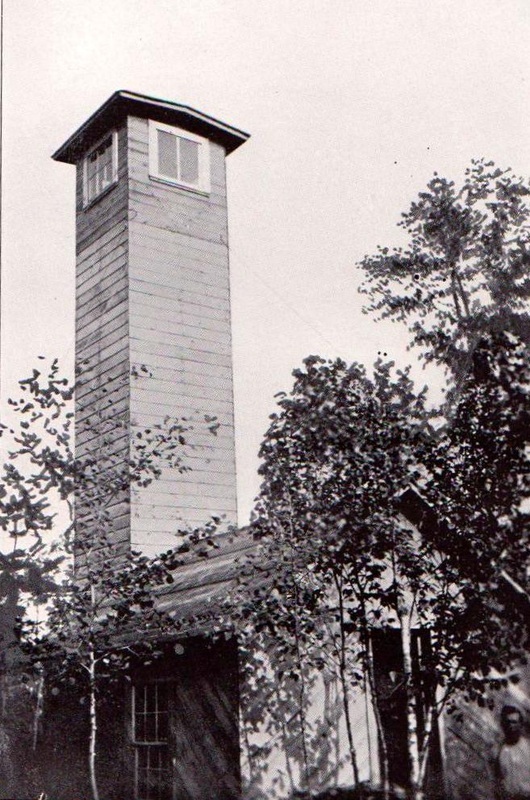 May 19, 1922: "Robert Schwarsenbach is just completing on the highest spot of Manetto Hill a fire observation tower, to serve primarily as a watch tower for forest fires in the South Woods district. 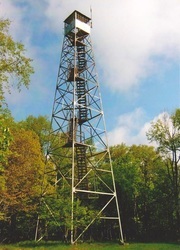 Although Mr. Schwarsenbach will be glad to have his neighbors enjoy the view from this tower, he feels that an unrestricted access in his woods would bring with it serious dangers, as was shown by a forest fire here last Sunday, which was apparently started by a lighted match or cigarette dropped by a careless visitor. He has therefore decided that to go through the woods of Manetto Hill Farm, visitors will be required to get a permit at the poultryman's cottage, which permit is to be handed over to the watchman at the tower. Members of the South Woods Nature Club will have access by showing their membership card. These permits do not entitle one to admission to the grounds near the house and the reservoir, which are marked as 'private.' Everyone is requested to be very careful not to smoke, not to pick the wild flowers, and not to start campfires. Do not leave papers and bottles around, and you will be welcome another time. 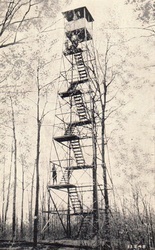 May 15, 1940: "Work is under way on a new fire observation tower on McCarty Hill, between Mutton Hollow and Whig Street, overlooking wide forest tracks from Little Valley and Elliottville to Allegany State Park, south of Salamanca. Ground was broken Monday by workers from the Hungry Hollow CCC camp for the concrete piers for the steel tower. 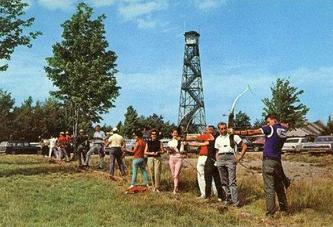 The tower will be eighty-two and a half feet high, with a glassed-in observation cabin at its top. 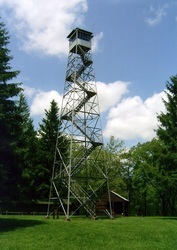 Construction of the tower is expected to be complete early in the summer, when a ranger from the State Conservation Department will be assigned to the location to watch for fires in the surrounding forests. A cabin for the observer will be built by the CCC near the base of the tower. November 1, 1940: "During the remainder of hunting season, certain areas near Company 246, CCC Camp S-106, near Salamanca, will posted to hunters while CCC workers are working in those areas, according to the company commander. 1. Along the Rock City Truck trail near the camp. 2. Along the Mutton Hollow Truck trail from the site of the new fire tower on McCarty Hill to about one mile from Great Valley. 1922: "During the winter of 1921-1922 a suitable observation station site to cover the bulk of the forest and woodland in Rensselaer County was selected on Number Seven Hill, just north of the village of West Stephentown. The commission brought to the attention of the board of supervisors of Rensselaer County the advantages of such a station and urged that the fourteen towns of the county contribute $100 each to defray the expense of putting in a standard tower and telephone line. Twelve of the fourteen towns responded by voting the requested contribution. The Towns of Sand Lake and Schaghticoke have so far refused to co-operate as towns, although influential citizens of Sand Lake have agreed to raise by personal subscription the contribution due from their town. October 16, 1969: "William Henry Nolan, 65, died Saturday at the Keene Valley Hospital. He was born Aug. 30, 1904, the son of John and Margaret Dockum Nolan. August 9, 1964: "Two rangers and about six conservation personnel stayed in the area overnight, to continue efforts to stop the fire. Rain between 2 and 3 a.m. Saturday helped bring the fire under control. 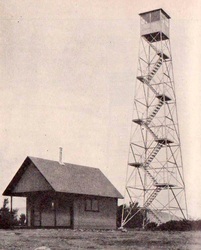 October 21, 1938: "While forest fires threaten throughout the woods of the state, workmen from the water and light department daily are utilizing a 40-foot fire tower just completed this week to guard a thousand acres of woodlands owned by the city from fire damage. Perched high on a ridge north of the city, the new steel tower overlooks the entire watershed of the city reservoir system. Planting on the watershed was completed this year, rounding out a 26-year program of land acquisition and reforestation. Now the city owns the complete watershed, a tract of 1,026 acres, all of which is planted with trees. Determined to prevent devastation of this forest by fire, the department this year erected the fire tower and installed a telephone line from the tower to the city telephone system, with three stations set up in the watershed for reporting fires. October 1959: In a cost cutting effort the State abandoned the lookout services. A transfer of title was made to Suffolk County, so that future protection could be handled by the county. 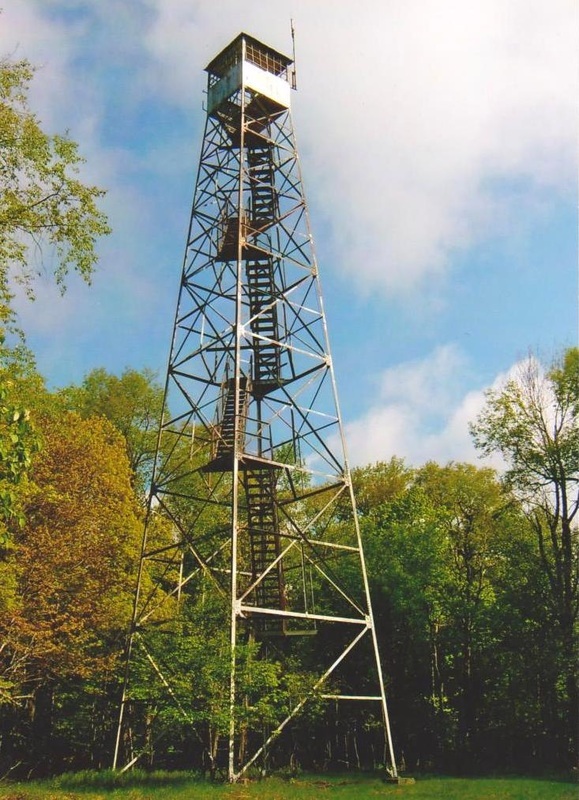 1926: The Allegany State Park Commission erected a 60-foot Aermotor tower as a part of their fire protection system. September 23, 1933: "Considerable progress is reported on the projects which members of Camp 33 of the Civilian Conservation Corps, near Point Summit in Allegany State Park, have been carrying on in the park. April 7, 1942: "Harry Gray of Broad street, fire observer in Allegany state park, today took up his six-month vigil in the summit tower between Salamanca and Big Red House. He will live in a nearby cabin, according to Oscar Lindberg, chief park ranger. Mr. Gray is responsible both to the park commission and the state conservation department, Mr. Lindberg said. 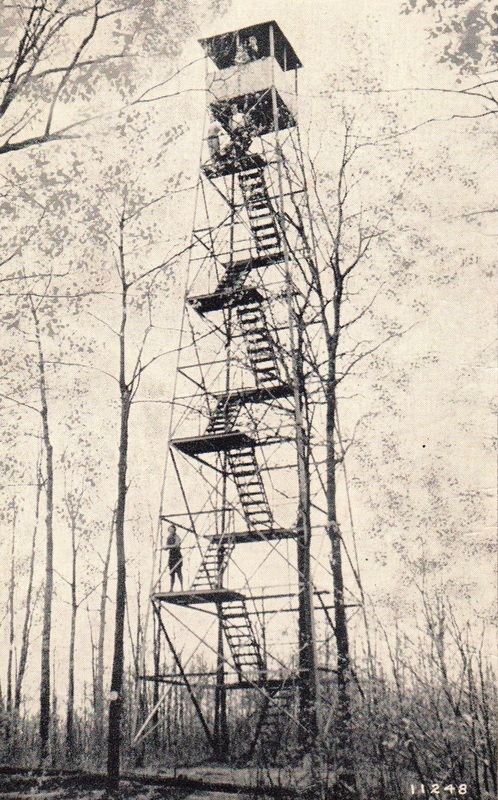 April 27, 1950: "Following on the wave of the first warm spell which dried out grass and underbrush resulting in numerous small fires, observers at mountain fire towers in the area have taken over their posts for the season, according to Clarence Petty, Potsdam, district forest ranger.